"Flocking" is a fine short fiber powder used to creat a fuzzy texture to mimic the effect of fine animal coats, feathers, and model scale carpets for dollhouses and model cars. In some lengths it can be used for long haired animals, as well as for ground cover and terrain for model train scenery and gaming terrains. 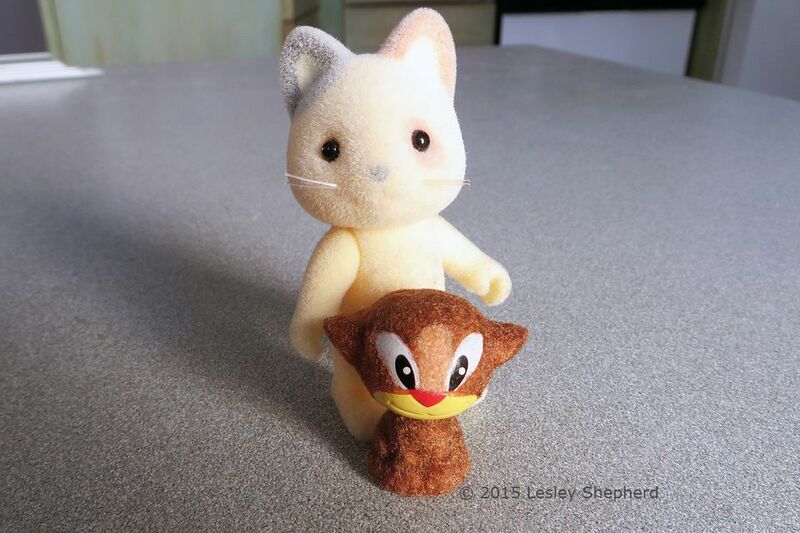 It is commonly found on some collectible miniatures and toys (like the Calico critter / Sylvanian Family Cat shown here). For practise projects and smaller scale models it is easiest to begin using commercial brands of flocking and work towards creating your own custom fiber blends as your technique improves. Stampendous is a commonly found brand available in a wide range of colors from scrapbooking and craft stores. Once you have tried it for a few projects using single colors and custom blends, you can go on to make your own flocking. Flocking can be made from any fiber. Crafters and modellers often cut their own flocking from strands of fiber roving especially mohair, wool or alpaca. Rayon and silk as well as feathers can be used to make special effect flocking. The basic 3D flocking project on the pages that follows, shows the steps in transforming a small 3D plastic model (a toy cat from a Kinder Egg) into a flocked miniature. In the case of this toy, the base orange color was left alone to show how well the coating works. For model projects, the color of the miniature should be painted with an undercoat which matches the desired flocking colors. An even easier project to use flocking and flocked stickers for miniature rugs and carpets can be found here. This project is flat, so the flocking process is much simpler. Safety Note - Flocking is a fine powder which can easily be inhaled. When working with flocking wear a dust mask. Work over a piece of paper or flexible cutting mat where you can gather the unused flock fibers up for re-use, to avoid them becoming a dust hazard in your work place. Prepared flocking is usually cut in 'clumps' and compressed in a small jar for sale. To prepare commercial flocking for use, use the back of a spoon or a set of bent nose tweezers to break up the clumps and stir the fibers before you begin to apply it. Commercial flocking powders don't create a 'napped' or directional covering as they are generally too short to arrange in one direction. The short commercial versions create a fuzzy, multi directional layer. Longer fiber flocking can be arranged in napped or layered arrangements for animal coats by applications of clumps of arranged fibers. For this project we'll start with basic multi directional flocking in single colors. Special types of electrostatic longer fiber flocking are available from model train suppliers to create longer grass clumps. This type of flocking is usually set in place using a special electrostatic flocking gun or "static grass applicator" . To apply flocking powders to a 3 dimensional background you need to choose an appropriate glue. The glue must be compatible with the material you are using, and it should be something that can be applied in thin, tacky layers. If the layers are too thick, the flocking will be uneven and the detail on the miniature or model will be lost. I'm showing glue applied straight to the plastic of a hard plastic toy. The glue in this case is a tacky pva glue, which will act as a coating for the plastic and which will hold the fibers securely with a thin coat. The method of applying flocking that follows makes it easier to set an even coat keeping detail lines visible. For the most successful flocking, sand the plastic or other base lightly before applying your choice of glues. If possible, surfaces should be colored to match the undertones you want for the flock, or coated with a tinted primer to blend with the flocking color you are using. On the sample used for these instructions I have left the bright orange plastic visible so you can see the background more clearly. Normally I would use a primer which adheres tightly to plastic in order to blend in the background before I applied flock . Something like Testor's Model Master Acryl or Mr Base White 1000 give a good thin base for applying flock if the base color of the object needs to be shifted. When you apply glue to hold flock, apply as thin and even a coat as possible over a small section of the model's surface. Use a glue applicator or a paste brush. You don't want the glue to run, or collect on the downside of the section you are working on. Only apply glue to an area where the flock can be applied easily without danger of the glue moving or dripping. To work with flocking, work over a sheet of paper or a lightweight cutting board which can be folded to return excess fibers to a container. With commercially prepared flocking, the type shown is from Stampendous, all the fibers are the same length. To apply them to a 3D project, pick up a layer of fibers which have been separated from their clump, (I pick them up with a pair of tweezers) and drop them over the glued area of your project. Make sure there is a thick layer in place over the glued area. Use your finger to gently press the fibers against the surface so the glue will grab. Do not move or shift the fibers with your finger. The lines on many surfaces you want to flock will get lost if the flocking or glue is too thick. To make sure there is an even coating of flocking on a 3D surface, use a stiff, worn artist's brush to gently press the flocking fibers into the glue. The brush should be used straight up and down to gently 'pounce' the fibers into the glue layer. You don't want to use the side of the brush or brush the fibers against the surface of the model or you may push the glue and fiber into uneven layers or push the glue away from some of your model resulting in an uneven flocked coat. Once you have "pounced" the fibers into the glue, set your model aside for the glue to dry before you fill in another area. Working and handling your piece when the glue is not completely dry can cause your model to end up with bald or thickened areas of fiber. Once you are sure the glue is completely dry, use a dry stiff artist's brush, or an inexpensive puffer camera brush, (see the tips for better painted surfaces) to brush off any excess flock powder onto your work surface. Try to avoid strong brush strokes which make break the flocked surface. You only want to remove the excess. Once your section of flocking is completely dry and stable, begin to work on the next adjacent area. If possible divide curved surfaces at the crest to avoid any difficulty with sliding glue. Use a fine pointed applicator to make sure an even coat of glue is applied right to the line of the previous section of flock. Take care to apply as thin and even a coating of glue as possible so it matches your previous work. In the example on this page, you can see how small amounts of the under color (orange) can be seen below the flocking. The effect with brown flock works as orange is an undertone. If white flock was chosen, the orange would be too obvious. As you apply flocking, you should go over the finished areas with a brush after the glue has thoroughly dried, to brush away any excess flock on a section. Often you will find small areas where the glue didn't go into the detail area, (see the sides of the nose in this photo) or areas where flocking / glue did not adhere in an even layer. To touch up any bald areas without flocking, use a fine pointed tool (a dressmakers's pin, an embossing tool, or a silicone tipped clay or paint shaper) to apply a small amount of glue to the bald area. Try to avoid applying extra glue over an already flocked section at the edge of the repair area. Reapply flocking, press into place, pounce with a stiff brush, and set aside to dry. When an area of flocking is completely dry, you can add a contrasting color to other areas of your model. Here the nose section has been coated with glue and a light tan flocking applied to that area. When you are applying contrasting flocking, try to apply it as close to the actual area you are trying to cover as possible. Although the flocking will not stick to the darker flocked areas, loose fibers will become lodged in the darker coating and can be difficult to remove. For some flocking projects you may want to custom blend colors. This is especially true of grass for terrains where a blend of greens, yellows and some tan make make a far more realistic grass that a single green color. To blend the flock, mix small amounts of the colors you want during the flocking preparation step. Make sure you mix enough to cover your entire project in order to prevent a patched effect from slightly different color blends. To finish flocking your miniature, gradually work on all the areas where you need flock. Allow to thoroughly dry and brush away the excess carefully before you add flocking to the adjacent area. Brush carefully around the areas where there is raised or sunken detail on the miniature. Compare the photo on this page, of the finished flocked toy, to the photo on the previous page where the body has not been flocked. Even after flocking some of the detail of the paws and legs can still be seen. Saving fine detail like this requires paying close attention to the thickness of your glue in the detail lines of the model.